The clowns in Hofesh Shechter’s SHOW aren’t just creepy, they’re homicidal. By turns gambolling fools, sage advisors and blank-faced killers, this octet of jesters – dressed in ruffs, frilly blouses and waistcoats – veer violently between the status of showman and executioner. No sooner have they slashed a throat than they’re skipping off to Shechter’s rumbling and percussive soundscape, fingers a-flutter with sinister razzle-dazzle. It could be a comment on the absurd and noxious political realities of today, or just simply a show. 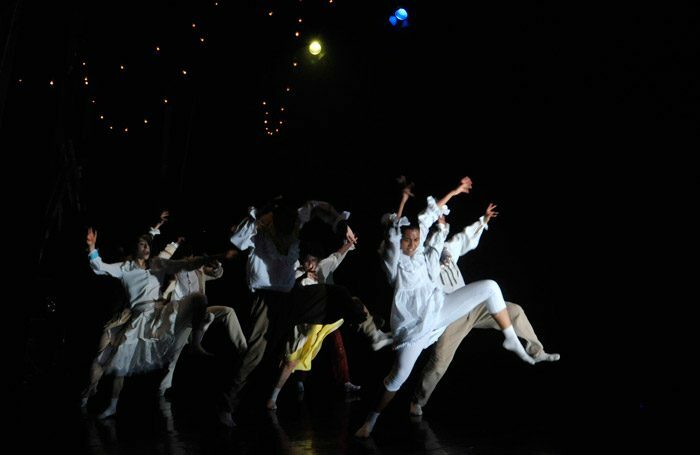 Performed by the extremely talented dancers of junior company Shechter II, SHOW makes use of the choreographer’s signature physical language, that absorbing and exhilarating mix of low-hipped simian loping, twitching wrists and kibbutznik folk steps. A dissipated huddle, raving and flailing, will morph into processional patterns, their arms aloft in a gesture that speaks of devotion and defiance. SHOW plays successfully on its choreographer’s status as something of a prankster, whose previous works include mock-serious confessions of adultery (in Barbarians) and a faux Middle-Eastern chant that turns out to be a repetition of “Nigel Farage” in Untouchable for the Royal Ballet. Again, SHOW plays tricks on its audience, not just in the way that the graphic garottings and gut-punches are instantly followed by blithe grooving on the spot. A supposed curtain call in which we’re suddenly clapping a series of brutal tableaux as the lights go up and down calls into question our own complicity and passivity in the face of atrocity. Or perhaps it’s just a joke.